First, the changes century by century - going all the way back to 1659. (Note that the daily record for the first few decades is unreliable, but the monthly, which this is derived from, might be okay. Still, I'd take a grain of salt with the left hand column.). This century is only just beginning and the average so far is already more than 0.7 °C (1.26 °F) above the mean of last century. That's huge. Then the changes decade by decade. 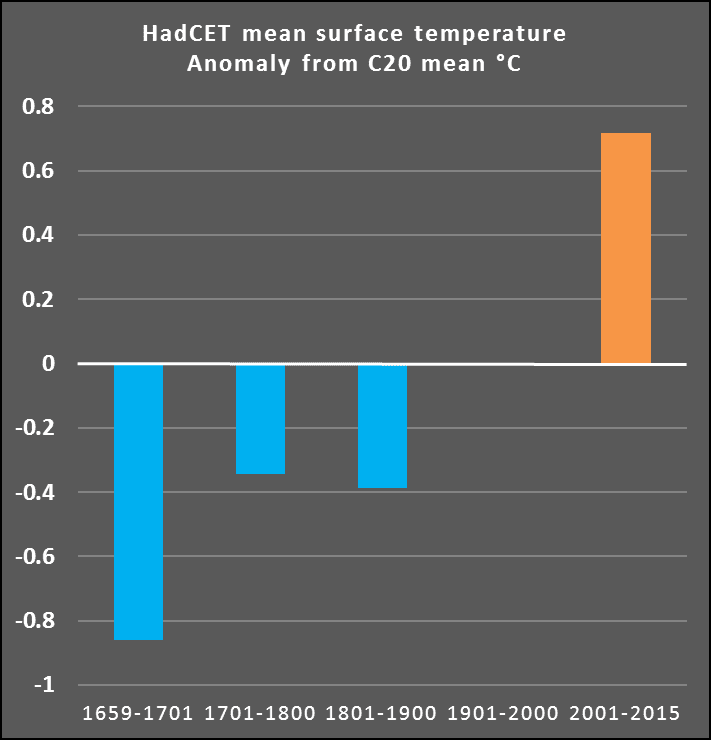 The decade from 1996-2005 was 0.79 °C (1.4 °F) above the twentieth century mean, the decade from 2006-2015 was a tad cooler, at 0.63 °C (1.13 °F) above the mean. 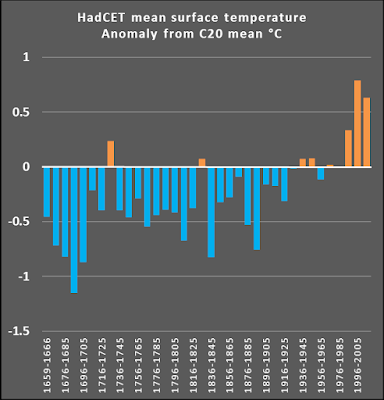 Finally the changes since 1950, showing the trend, which for that period is rising at 0.17 °C (0.3 °F) a decade. Global warming is no slouch in Central England. 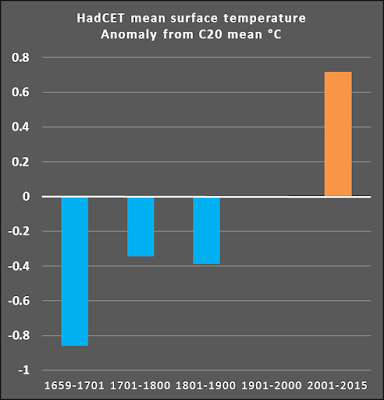 Last year, 2015, the average for the year was 0.78 °C (1.4 °F) above the twentieth century mean. 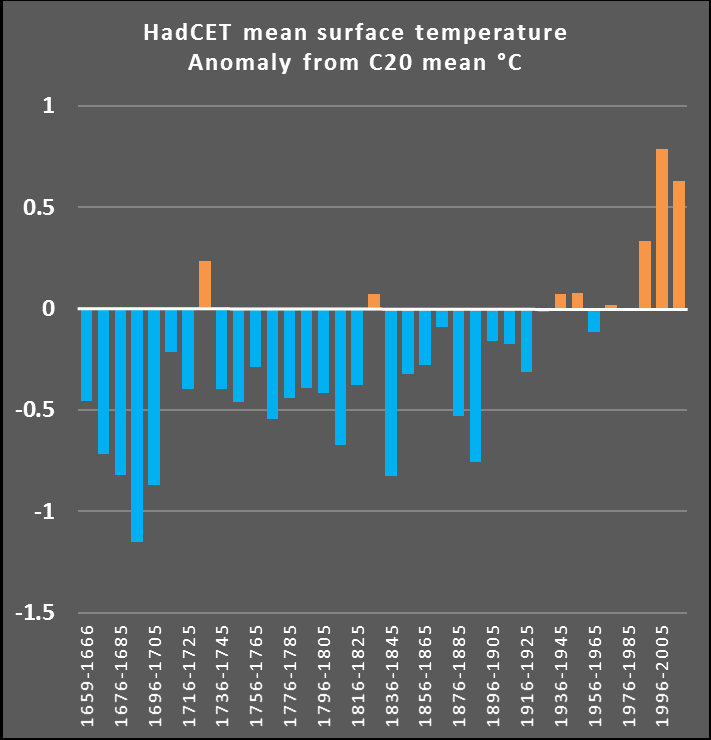 In the past 27 years, since 1988, the Central England temperature has only dipped below the twentieth century mean three times. In 1993 it barely grazed it. In 1996 it dipped lower and 2010 lower still. 2010 was a relatively cold year in the UK for recent times. It's Andrew NEIL, aka 'Brillo Pad' due to his frizzy hair, [which may or may not make sense outside the UK]; he's a TV presenter and journalist, presenting some serious and lighter political shows. He's been consistently contrarian on GW, for example inviting the cranky Piers Corbyn to do a segment repeating the usual talking points, and consistently and unrepentendly wrong on the science. 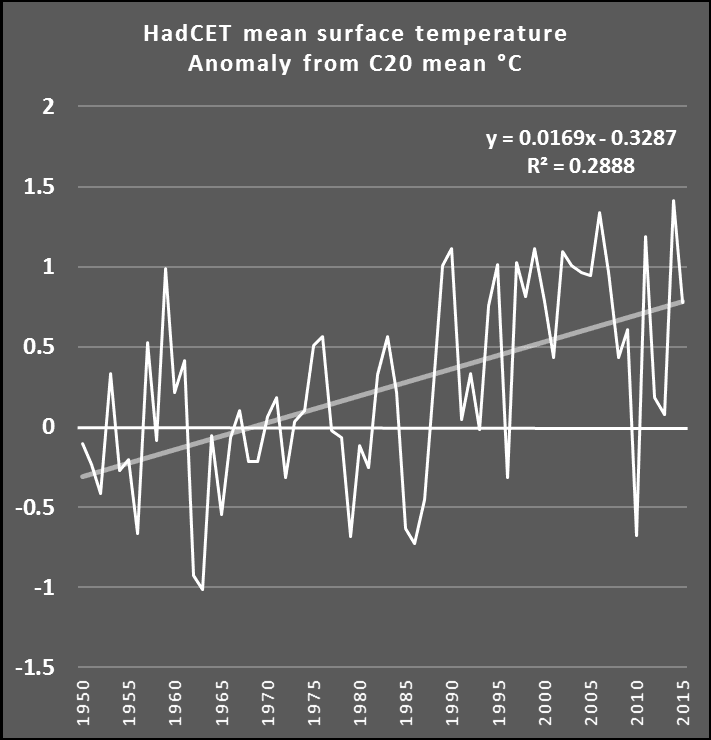 The CET is the longest instrumental series in the world, and Chris Monkton is fond of quoting periods of rapid warming in the past. However it is unreliable before around 1770, due to readings being taken indoors or inferred from weather conditions and missing values being infilled from Utrecht, which is a long way from Central England. Thanks - me being sloppy and careless. Sorry Phil. Sorry Andrew Neil. Quite a good political commentator. Completely clueless when it comes to climate or science. I'd have thought that even a climate change denier would know that global warming is not recorded using a single thermometer. It's still just central England, but if there's ever a cooling trend then don't expect that to matter to people for whom the scientific method is just a mask to use to score political points. Yeah OK, my post was sloppy, but what % of the globe is covered by them? OK just say plainly what you are trying to say, no need to resort to conspiracy theories. Millicent's comment still stands. 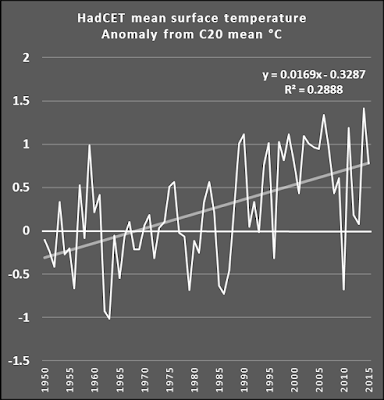 The CET is not a measurement of the Global Mean Temperature. The CET is a small area. I speculate it is also affected by aerosol pollution as a lot of it is industrial. Andrew Neil is obviously leaning towards conspiracy theory, with the "Just asking questions" approach and use of "shill"